This page covers the author of Candide. For other authors named Voltaire, see the disambiguation page. Voltaire (1) has been aliased into Francois Voltaire. Works have been aliased into Francois Voltaire. En el marc VII Cicle de filosofia: Desconstruir Europa, tindrà lloc la xerrada: 'La funció política del mestre: consciència i creativitat a Voltaire, Dewey i Gramsci'. François-Marie Arouet, who used the pen name Voltaire, was one of the most influential figures of the Enlightenment. Known for his witty and satiric pen, he supported social reform and freedom of thought and religion. He bravely criticized many of the powerful persons and institutions of his day (at times he had to go into exile from France). Voltaire's ideas contributed to both the American and French Revolutions. Voltaire has a Legacy Library. Legacy libraries are the personal libraries of famous readers, entered by LibraryThing members from the Legacy Libraries group. "Voltaire" is composed of at least 2 distinct authors, divided by their works. You can edit the division. 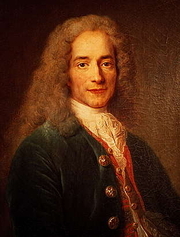 Voltaire is composed of 5 names. You can examine and separate out names.